It’s hard to believe that we have come to the end of the academic year. Pre-primary has completed their portions and now we have been revisiting concepts done through the year. Parents often ask what they can do to help their child in getting ready for first grade. We have been giving suggestions in our previous newsletters. Getting your child ready with reading skills is an important area you could help the school with. When adults read aloud to children, children have the opportunity to hear new words which help them with their own independent reading. In addition, reading aloud stimulates imaginations, expands attention spans, and nurtures emotional development. Children who are read to at home and who read to an adult at home have a higher success rate in school. In the area of math, our goal as teachers and parents is to help the child develop number sense. To accomplish this goal we recommend continuing some of the activities we have been doing with the children in the past year, such as : skip counting by 2’s, 5’s and 10’s. Counting backward from 20 , or to look for patterns in everyday life. Sorting objects in a variety of ways and by more than one attribute. Besides revising concepts children are busy preparing for the Graduation day ceremony. We have had a terrific time working with the Sr. KG classes. This is always a bittersweet time for us as teachers. They are so ready to move on to the first grade but we will miss them. Thursday 26th February – Graduation day. On Saturday, 8th February, an INTER SCHOOL KARATE CHAMPIONSHIP was organized by United Karate Association at Gitanjali senior School , Begumpet . 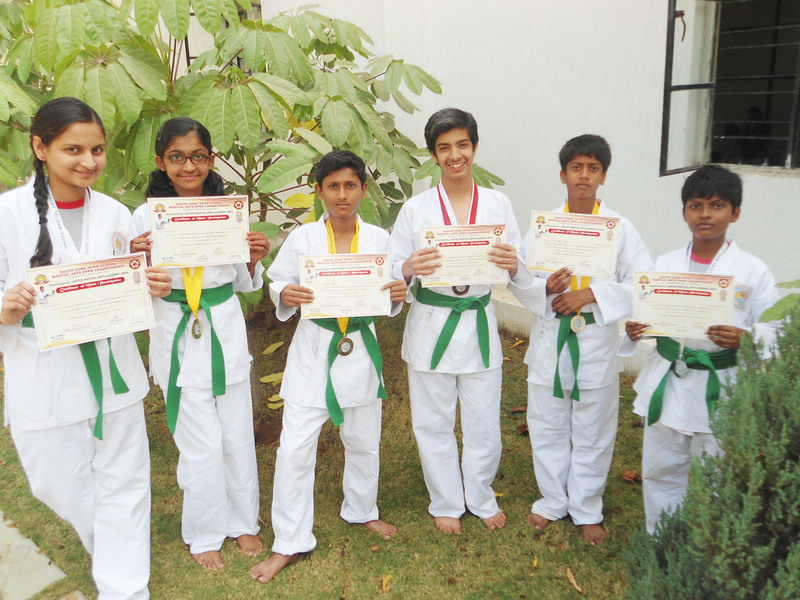 A total of 12 students participated from Suchitra Academy out of which 6 won medals. The remaining 6 students got participation certificates. Congratulations to all! The new batch of grade IX began its NEW ACADEMIC SESSION from Wednesday, 18 February, 2015. Lots of new challenges await them this year and we are confident that they will come out successful. We wish them all the very best for this new session. Dear Parents, with the SA2 just around the corner thorough revisions are the focus now. We have already mailed the revision schedule to you, please follow that on a daily basis and help your child learn for the next day accordingly. The datesheet for the assessments has already been sent to you with the portions. Timings for the assessments are 8.30am -12.20pm. The dates to pick up books and uniforms for the new session will be mailed to you soon. Testing of vision at school age is crucial because it would mean early detection of any sight problems. Visual health is essential for good quality of life. In view of this an ‘EYE CAMP’ was organised at Suchitra Academy on Wednesday 28th and Thursday 29th January. Teachers sensitised children on the importance of eye care, kids were also given tips to take care of the eyes like not to watch T. V. or computer for a long time, not to play with sharp objects and eat a lot of fruits and salad. Recitation Competition for Pre-primary was held at Nasr School on Saturday 31st January. Arya Reddy and Prisha Sarda from Sr. KG represented our school. Our kids displayed great confidence and performed very well. They participated in this competition with enormous zeal and were pleased to present themselves on stage. The last ‘Theme-end presentation’ of this academic year was held on Friday 6th January. Though there were a large number of absentees, kids performed very well. Thank you parents for being there and encouraging the kids throughout the academic year. The school year is quickly coming to an end. The Pre-primary classes have had a busy year learning to read and write. We are so proud of their accomplishments this year and will be continuing to work on our literacy and math till the end of the academic year. REPUBLIC DAY was celebrated at school on Monday, 26th January 2015 with fervor. The entire staff, the school captains and prefects were also present. The tricolor was hoisted by the Director-Principal Mrs Renu Shorey. Students and teachers sang patriotic songs and dwelled on the significance of this day. An Eye Camp was held at school on Tuesday, 27th January and Thursday, 29th January 2015. This camp was conducted by Dr Agarwal’s Eye Hospital. Children from all grades and the entire Suchitra staff got their eyes checked. The doctors gave advice on proper eye care and stressed on the importance of nutritious diet to maintain healthy eyesight. It is rightly said, ‘Health Is Wealth.’ On Wednesday, 28th January 2015, a special assembly was conducted on the topic ‘TO ENJOY THE GLOW OF GOOD HEALTH, YOU MUST EXERCISE’. A ppt highlighting the importance of exercise in our daily life was shown. The students spoke about the importance of exercise in today’s stressful life. The students also did an enjoyable aerobic routine which set the mood for the day. The entire school staff went on a PICNIC TO ALANKRITA RESORTS, Secunderabad on Saturday, 31st January 2015. It was an extremely enjoyable day where the teachers could enjoy playing various team building games, relaxing and tapping their feet to peppy music. It was a beautiful way to de-stress and rejuvenate themselves for the remaining term. We are very proud to announce that Arunima V. of grade V has won a bronze medal each in Pair skating and Pair dance in the 10 to 12 years age category, in the 52nd National Roller Skating Championship 2015 organized by the Roller Skating Federation of India. She represented Telangana state in Artistic Skating. Very well done Arunima! We wish you many more laurels in the future. 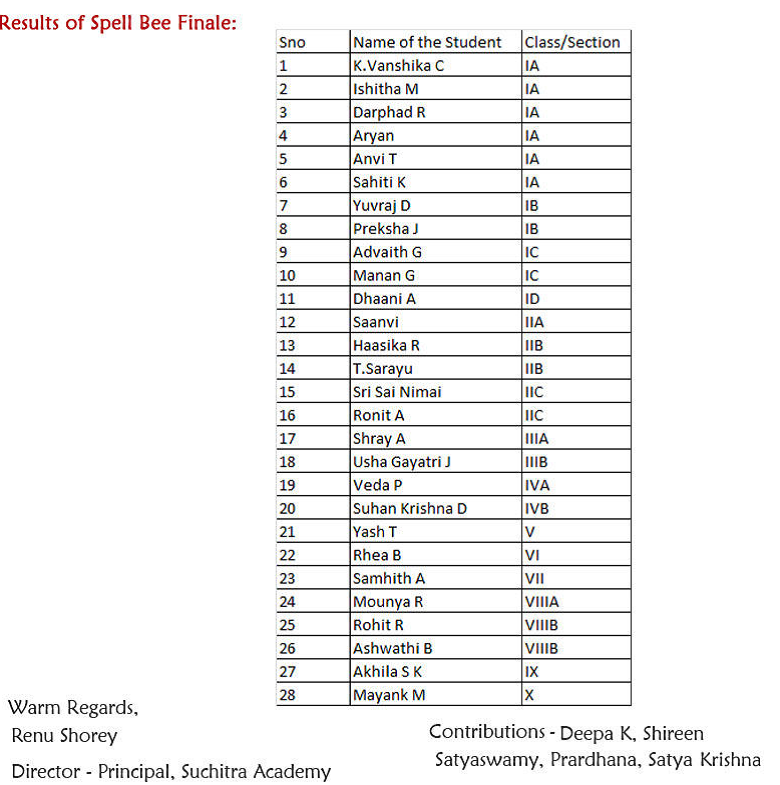 9th to 16th Feb – 2nd Prelims Grades IX & X. Most classes are done with the syllabus for the year and the teachers would be spending time on revising the concepts. The portions for SA 2 and the date sheet etc. would be sent by Monday 9th Feb. It would help if you draw up a revision time table for your child and regulate his revision at home too. As we all know, there is always something fun going on at Suchitra Academy. One such event was the QUIZ CONTEST for the Sr. KG kids on Friday, 23rd January 2015. The quiz was held, based on the 1st term theme questions. It was amazing to see the way our kids performed. The participants showed remarkable team work, great determination, passion and hard work. Students of Sr. KG B took the first position followed by Sr. KG A in the second position and Sr. KG. C in the third place. Please support your kids learning at home too while we work with them at school. Here are some suggestions of ways you can support your kids at home. Read to your child each night or have him/her read to you. Encourage daily hard work in your child/children. On Monday, 12th January, the school reopened after the Sankranti Break. The students as well as the teachers came back refreshed and are now looking forward to a busy month as the academic session nears its end. The INTERNATIONAL ENGLISH OLYMPIAD was held on Tuesday, 20th January 2015. Students from grades II to X participated in the Olympiad. 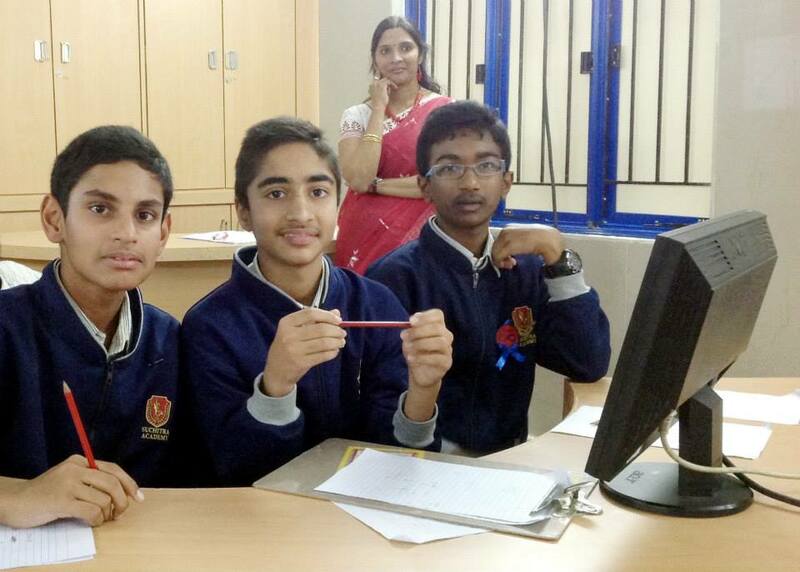 On Wednesday, 21st January 2015, the final round of the INFINITY INTER SCHOOL MATHS CHAMPIONSHIP was held at the St Andrews School, Bowenpally. 17 schools participated in the preliminary round which was held on 9thy January 2015 and of these, the students of Suchitra Academy qualified for the final round that was held on 21st January 2015. Despite the tough completion in the final, our students Sarvesh Paradkar, Rohit.R, Manas Gaddam and Akash Senthil Kumar performed creditably and were tied at the 3rd place. On Friday, 23rd January, grades V to VIII went on a field trip to EMRI (Emergency Management Research Institute), a pioneer in Emergency Management Services in India. The students saw how GVK EMRI handles medical, police and fire emergencies through the “1-0-8 Emergency Service”. They saw the state- of-the -art ambulances, the training rooms and the communication room. They were amazed to learn how through state-of-the-art emergency call response, centers are able to dispatch over 2600 ambulances across Andhra Pradesh, Gujarat, Uttarakhand, Goa, Chennai, Rajasthan, Karnataka, Assam, Meghalaya and Madhya Pradesh. It was a very informative and educative trip. A special assembly was held on Friday, 23rd January 2015. A ppt on Republic Day was shown which highlighted the history of the day and its significance. A video on the freedom fighters of the country was shown. The students also took a pledge and promised to love and serve the country with honesty and dedication. 4th to 11th Feb – 2nd Term Assessment Grade VIII. We have sent the fee slips and the transport `slips to you. Please note the last dates mentioned. We are moving to the end of this academic year and already gearing up for the next one. It’ s important that children spend sufficient time on revising their lessons and that you monitor it closely. This would bring a satisfactory close to their present learning.